At T&S Window Screen Repair and Window Cleaning, installing pet screens, grilles, and doors has become a specialty of ours. We can custom install extra durable nylon pet screens on windows, sliding screen doors, swinging screen doors, and retractable screen doors of any size. Nylon pet screen mesh is seven times stronger than standard screen mesh and able to withstand a lot of pet-related wear. We can also install heavy-duty aluminum pet grilles on our sliding or swinging screen doors, which come in three sizes and grades: Super, Imperial, and Apollo. Additionally, on our Colonial swinging door models, we can add a pet door to fit nearly any small, medium, or large breed dog. 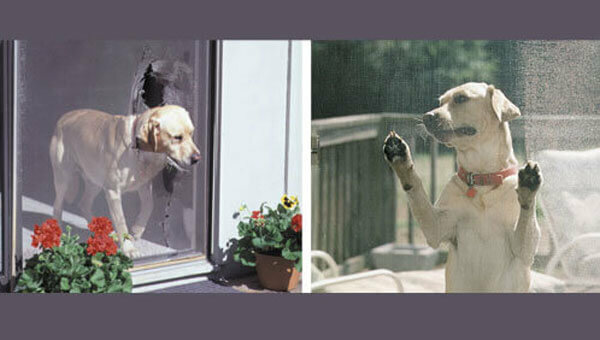 Whether you have cats climbing on your screens or dog that pushes against your screen door every time you get home, T&S Window Screen Repair and Window Cleaning has an affordable and reliable solution for you. Call today for a free consultation on our pet screen, grille, and door installation services available to all of Orange County and in surrounding cities, such as Tustin, Irvine, & Mission Viejo. Over the last 25 years, we've completed tens of thousands of jobs and have an excellent reputation for quality workmanship, personalized customer service, and competitive rates. We are fully licensed, and stand behind our work with a one-year warranty.